Accreditation on the side below the drivers window says it comes from Greta Main. I tried to look up the plate but couldn't find anything on it on the service NSW plate checker. Would anyone know if this is either an EX STA Sydney bus (that was withdrawn years ago in Sydney) or an EX Newcastle Transport bus? I recall someone saying back in March some of the NT MAN Midi's were due to go and I wonder if this one up above was one of the first lot to go. Notes	ex (3666) m/o3666 STA, Sydney, NSW. The disposal list http://fleetlists.busaustralia.com/stad ... search=MO2 shows a lot more but not the latest rego CO74JU. What is the accredition number? 43079 for Damien's Party Entertainment Pty.Ltd.Issued on 7/5/18. Thanks guys for the information on the bus, looks like ex m/o 3666 has been through a lot of owners. I actually saw this MAN bus a lot earlier as I was catching a rail bus into Newcastle, it got ahead of my rail bus at Hamilton and eventually turned right onto Donald Road and went somewhere from there. After photographing the Rail replacement buses on King street, I took some photos of the Interchange LR construction work (was in a rush so not the best but got what I could get) then from there decided it'll be too much to walk back to King Street rail bus stand just to get off at Hamilton as I too wanted to take photos of the 3 HVB there that I saw earlier as my first bus was pulling into Hamilton(one of which included their Volvo B7RLE CB60 EVO II which you rarely will see in Hamilton) so I walked, I was just making my way up Maitland road corner of Beaumont street when I saw the party bus again and not wanting to miss out on an opportunity to get a photo of it (Especially since it was an old ANSAIR and a MAN that was now privately owned) I turned back a couple of meters down the footpath and positioned myself to get the photo you see above. This is how I think it used to look when it was owned by a company on the central coast before it was sold off. Photo from company’s Facebook page. Last edited by andrew28121990 on Mon Jun 11, 2018 10:06 pm, edited 1 time in total. andrew28121990 wrote: This is how I think it used to look when it was owned by a company on the central coast before it was sold off. Interesting that I can see what appears to be a side destination sign but I think the front one was completely removed in that shot (the lighting makes it a bit hard to tell) The one in my photo pretty much confirms that it's not fitted with a front one anymore but if I was on the other side of the street would've been nice to see if it's still fitted with a side. Usually as we all know when buses are sold off the Desto units go but in some cases they get left in. 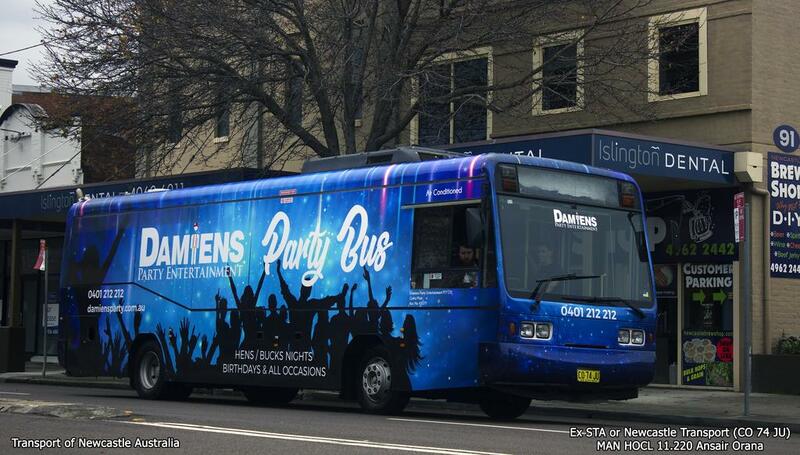 To be honest, I think Damien's Party Buses AOA looks a lot nicer on this MAN than the one above but that's just me. Quick Edit: And the photo above still shows it with it's "M A N" lettering. Mine doesn't appear to show it unless the AOA does a good job at covering up. updated - that little thing sure has got around! It's like a bus body mounted on a roller skate. It's dynamics would be 'fun' .